The biennial Career Mentoring Workshop was offered by the Computing Research Association on February 22 and 23, 2016, at the Westin Arlington Gateway Hotel in Arlington, V.A. The workshop consisted of a series of panels and was interspersed with opportunities to network with senior researchers and representatives from government agencies. There was a reception with the CRA Board of Directors and an interactive meeting with various NSF CISE dignitaries and research-appropriate program directors. 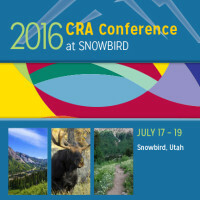 Click here to read a participant’s perspective on the CRA Bulletin.